Bark and Stroll is now under new ownership! Basilio Garcia and his wife Reyna, who have been with Bark and Stroll from the beginning, have taken over the business. Vanessa Kelly, and her husband, Andres Zuniga, started Bark and Stroll as a labor of love, and as an extension of what was already filling their days. Theirs is a home filled with the sounds of happy children, and two mature Golden Retrievers, Emma and Rex. Vanessa’s love of animals began on the farm where she spent her childhood, with all kinds of animals; goats, chicken, especially dogs, as playmates. Her husband, Andres, also shares her deep love and respect for animals. Vanessa often employs the help of Emma and Rex when introducing new dogs to walks or play dates. They are both friendly, easy-going, and exceptionally well-trained, and keep the energy in the group at a nice, steady level. The behavior of Emma, Rex and the rest of the Bark and Stroll pack is a reflection of Vanessa and her easy, calm nature. Vanessa and Andres also have strong family ties, and Bark and Stroll is truly a family business. 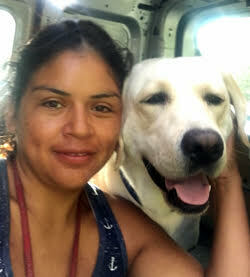 Christina Garcia started working for the family years ago as a mother’s helper and now both Christina and her brother, Basilio Garcia, are trusted co-workers at Bark and Stroll. Both Vanessa and Andres are also entrepreneurial by nature. They have individually, and as a couple, started several successful businesses including a mobile car detailing business, which Andres operates in addition to his work at Bark and Stroll. Everyone at Bark and Stroll considers the dogs in their care to be part of one large, loving family.